The gang's gathered for a little R&R, refreshments, and mingling. You're imagining a cocktail party? We're referencing elephants, zebras, and giraffes at the ol' watering hole, but the scenarios are actually pretty similar. 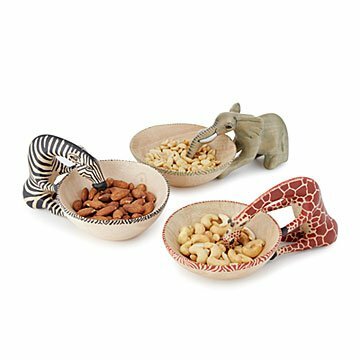 Make the spot where friends meet around food and drink a wild one, with these meticulously hand-carved snack dishes. Kenyan artisans craft each bowl from a solid block of jacaranda wood—either recovered from naturally fallen trees or cut to clear roads. Using techniques passed down for generations, they cut rough shapes, then refine details using chisels and other hand tools. Once the bowls and their animal adornments are carved, each undergoes a series of sandings with increasingly finer grit paper before getting dried in the sun. (Unless it's the rainy season, then they're dried in a small room heated by burning wood shavings and other offcuts leftover from the carving process.) Finally, every bowl is painted by hand. All of this is done in a small workshop in Kiambu, just north of Nairobi National Park, where the Kenyan wildlife that inspired these designs roam free. On the outskirts of Nairobi—Kenya’s capital city—George and Milkah work to provide vocational skills and work opportunities to unemployed youth. Their studio doors are always open to anyone interested in learning the art of hand-carving and painting. George, a university professor, has a keen interest in engineering and environmental conservation. Milkah, his business-savvy wife, brings creativity and her whimsical style to their studio. Together they source fallen and sustainably-harvested Jacaranda wood from across Kenya and use it to create beautiful designs with the enterprising artisans that make up their team. Hand wash with mild soap and water. When dry, apply food-safe mineral oil. Help condition and preserve your bowl with mineral oil. So glad Common Good offers unusual items from all over the globe! My brother plans to use this as a personal snack bowl.